For some little while now, I have been somewhat agonizing about having to purchase a set of tyres for one of my Coupes - specifically, in this instance, the Admirality Blue/Slate Grey Mark 2A Coupe that I bought in 1971. I had already, some three to four years ago, bought Bridgestone Conselas - one of which is shown as a comparison with the Avon Turbospeed MarkIV Nylon Crossplys. I came by those through a friend, who knew a friend in Canberra with a couple of old, non-functioning and dilapidated old Rovers who happened, by chance, to have four brand new of these Avons in his possession and that had never been used. Well, I agreed to purchase the tyres sight unseen, believing that they were Avon Turbosteels. When I met up with him to exchange tyres for money, I discovered to my consternation that they were Crossplys. Well, it was too late, and decided to bite the bullet to honour an agreement made with the friend of that friend of mine. You know what I mean. 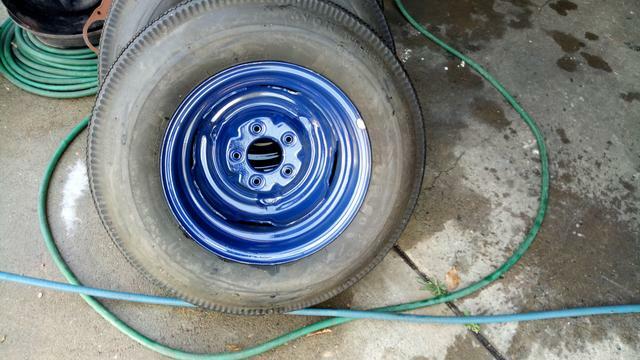 Many years ago, I already had the outside of the rims painted in the Admirality Blue, but the edges had copped a bit of a hammering being stored on top of each other, and the "new" tyres encouraged me to respray and refreshen the rims in 2pack in that colour. 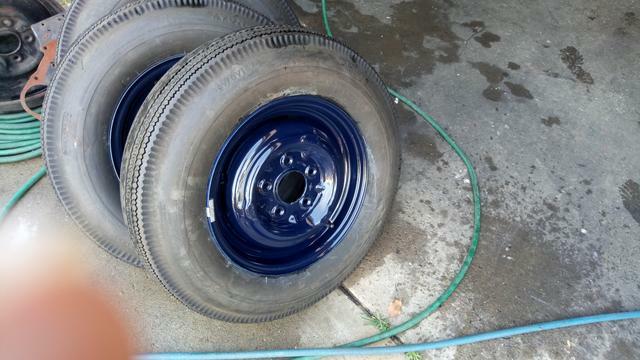 At the same time, I also utilized some long owned Royal Blue pressure pack to paint the inside of the rims. You can see the difference but, what the heck, the Royal Blue is on the inside and one does not normally see that area. So here are some pics. initially, and I will explain a little further hereunder. The video I am relating to is "In the Rover tradition, Reel 1 - it illustrates the trickery as far as the models are concerned, plus the difference in hubcaps as shown in my pictures. 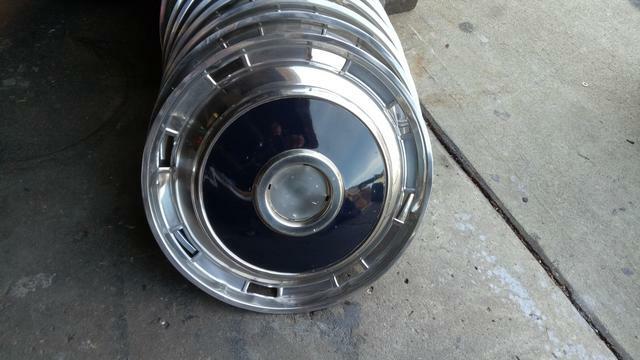 Incidentally, never at any time have I seen painted hubcaps as illustrated in this post. Last edited by Styria; 3rd February 2018 at 01:42 PM. Interesting comparison. It will be interesting to drive one of your P5's fitted with the bias ply tyres and one fitted with radials to see the difference. The tyre is much taller overall making the radials undergear the car. I've never driven a car with bias ply but heard about them. While my Citroen might be a 1954 model, like most citroens of the era it is fitted with Michelin Radial X tyres. I like the blue wheels and the painted wheel trims. 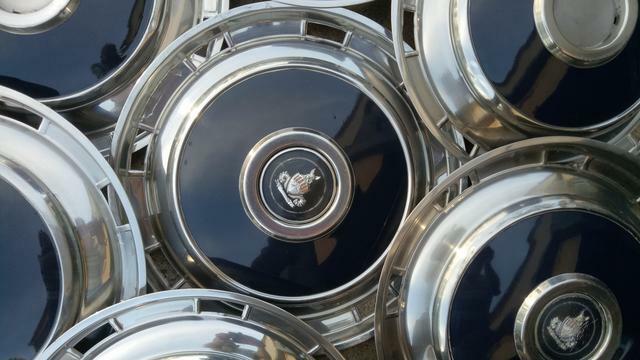 Pictures 3, 4 and 5 illustrate what was done to the hubcaps many years ago. More on that later. Picture 6 illustrates the difference in rolling radius when compared with the 185.65.15s that are fitted to a mark IIC Coupe that I bought from C107 who had purchased it at a huge Rover auction in Canberra last year. The Coupe also gives you an idea what the hubcaps should look like. Stainless steel only, with badge in the middle. Hi C107, to be honest I don't really know what to expect. Fifty five years ago, I fitted brand new Olympic GT Radials to my 1956 Rover 90, and the difference in roadholding had to be experienced - it was unbelievable. It was a different car.Yet, probably about three years later, I purchased a set of Dunlop Road Speed tyres for a Mark IIa I had at the time (I had traded the Rover 90on it). The Dunlops were known for their high speed qualities and they were indeed fitted to the Police Rambler Matador Police cars. Those Dunlops gave nothing to the Radial tyres of that time. Quiet, compliant and terrific in the wet. Those Hubcaps. 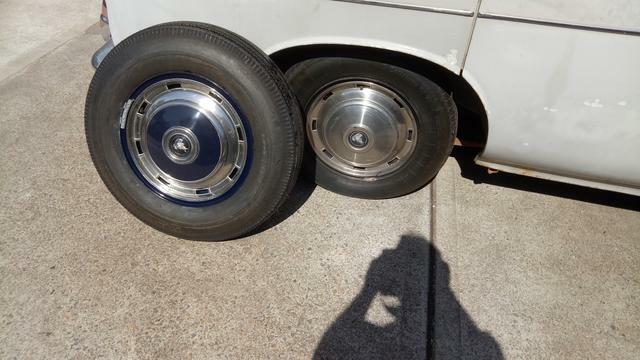 When the 1963 Mark IIA was resprayed, I had the painter modify the hubcaps to spray the inside circular area the same as the rest of the car. I had about eight of them done - four for my car, and four four one of my client's 1965 Mark IIC. It is also Admirality Blue and the car is indeed shown in one of the threads created by C107 when he came to deliver the grey Coupe he had bought in Canberra at what was known as the Flynn Sale, with about 140 Rovers being auctioned off. That Client's Coupe has since been fitted with later model Rostyle rims, and he purchased five brand new 15" Gemstone (!) tyres. 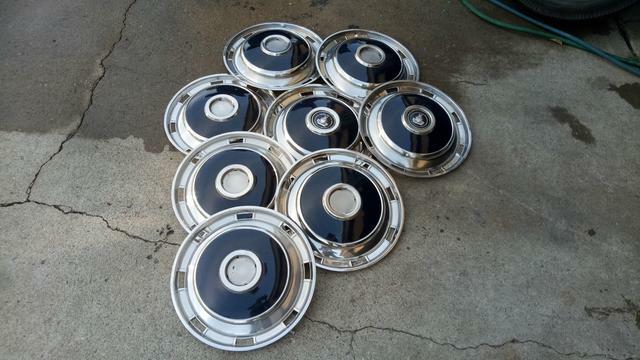 Thus, some of those painted hubcaps have become surplus to requirements. Last edited by Styria; 31st January 2018 at 12:02 AM. A word of practical advice Styria. If selling a car to someone either sell it unregistered or if registered make sure you supply a current pink slip so you can't later be accused of selling an un-roadworthy vehicle. I would maintain this is true for any private sale. You simply want to protect yourself. 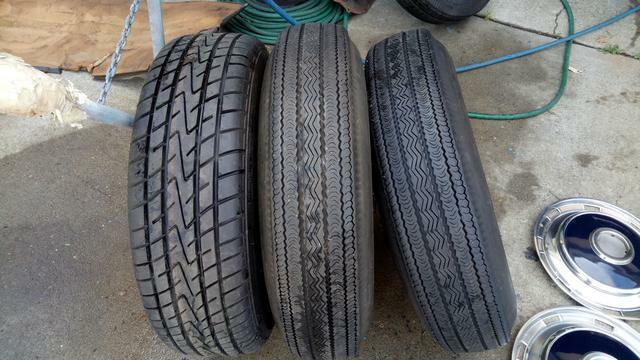 If the cross-ply tyres are past their use-by date (and I they must be) then I personally would not use them and would not put them on a car I was selling. As an option, they might be provided solely as an item of originality but not for road use. I know it is a case of buyer beware but don't place yourself in a position where you might be compromised. I have driven a Sunbeam Coupe from the late 50s and the owner uses cross-ply tyres for originality for shows - it's got a mind of its own on the road following ever change of surface rather than the intended direction; a disaster. I have also driven it on modern radials and it tracks straight and is a delight to drive. A Bentley MKVI on cross-plies is a nightmare; on radials the drive is reasonable. Just my thoughts and I am sure other people may have a different view. Hi Benz Boy, your view and. opinion are perfectly fair and reasonable, as well as appropriate. You will not get an argument from me on any of the points you have raised. If one could take your reasoning even further, one could contend that the Tyre Fitting workshop should not have agreed to fit out of date tyres. I needed to remain within the parameters of financial outgoings, and when the opportunity arose to purchase these tyres, I simply had to take advantage of it - another facet of the restoration process to have tucked away in the list of jobs that had to be taken care of. As a matter of some safety and precaution, the tyre place procured for me five new tubes as part of the fitting process, and naturally I asked for a full and proper wheel balance. This way, at least, I am not going to be plagued with small leaks had the tyres been fitted tubeless.